schedule for the American people and small businesses across the country. future. However, Congress departed without passing legislation to extend our current tax code and prevent massive tax hikes that arec oming January 1, 2011. Congress also failed to consider a real budget for Fiscal Year 2011.
upon the priorities of the American people and is the product of the America Speaking Out initiative--encouraging Congress to cut spending, end the uncertainty plaguing our economy, and fundamentally change how Congress operates. I encourage you to download a copy or print out the pocket card version at pledge.gop.gov. replace it with a common sense solution – providing real medical liability reform that would allow physicians to refocus on patients, instead of unneeded lawsuits, thus enabling greater access to more affordable care. Third, we were able to bring to the floor another vote on a proposal that cut back non-security discretionary spending to pre-bailout, pre-stimulus spending levels to save taxpayers $100 billion in 2010. While my colleagues and I were ready to stay and start making tough choices needed to rein in spending and reduce the size of government, the Majority in Congress decided they were ready to head home and so they voted against all three proposals. Mount San Antonio College, both teams are 4-0 so it should be a great game – go Renegades. Faces in the crowd at the grand opening of the Padre Hotel in downtown Bakersfield, one of the city's iconic buildings. * ... BRAVERY: Staff Sgt. Travis Brown, a Bakersfield native, was among 14 U.S. service members who received Germany's Gold Cross Medal for their bravery in rescuing wounded German soldiers from a fire fight in northeast Afghanistan. It was the first time the award had been given to troops from another nation. The German soldiers had been ambushed by more than 200 Taliban fighters during a patrol on April 2. U.S. Black Hawk helicopters extracted 11 German soldiers, three of whom later died of their wounds. Travis is the son of Dennis and Debbie Brown of Bakersfield. * ... MISS SMILE: John Ritter, former assistant principal at Garces Memorial High School, dropped me a note to correct a recent post on former Garces teacher Miss Smile. "While I do not believe that this slight editorial change warrants publication, I do believe that this ''ism' might suggest a different meaning given that many Garces students informed me that was really said was that "you were sent to the F row" by Miss Smile. "After all these years I still remember Miss Smile's classroom seating arrangement." And don't forget the annual Garces Fall Barbeque set for October 7. I omitted to include the date on a previous post. * ... BAD FORM: One of my regular contributors, who asked to remain anonymous, sent me this missive about yet another example of bad behavior in our town. "Only in Bakersfield would you go to a community concert and see a guy in the third row adorned in a baseball cap with the camouflage motif. He had hair peeking out around the edges so I don't think he was a recent radiation therapy or chemo patient. And only in Bakersfield would you see dozens of people chomping on gum as they enjoyed the concert. And I am talking chomping. Good manners are a thing of the past". * ... HABITAT: David Bynum, a lawyer at LeBeau-Thelen, dropped me a note to tell me about a fund raiser for Habitat for Humanity, Golden Empire. Turns out private organizations are sponsoring or building custom play houses that will be auctioned off for Habitat's benefit. Six houses are being built at the Kern County Fair and another is being built and displayed by Lennar Homes on Stockdale Highway across from CSUB. There will be a live auction on Sunday, October 10, at the offices of Modern Office Environments at 830 21st Street. The auction starts at 2 p.m.
* ... SPCA: The SPCA has always held a special place in my heart and I try to support it whenever I can. 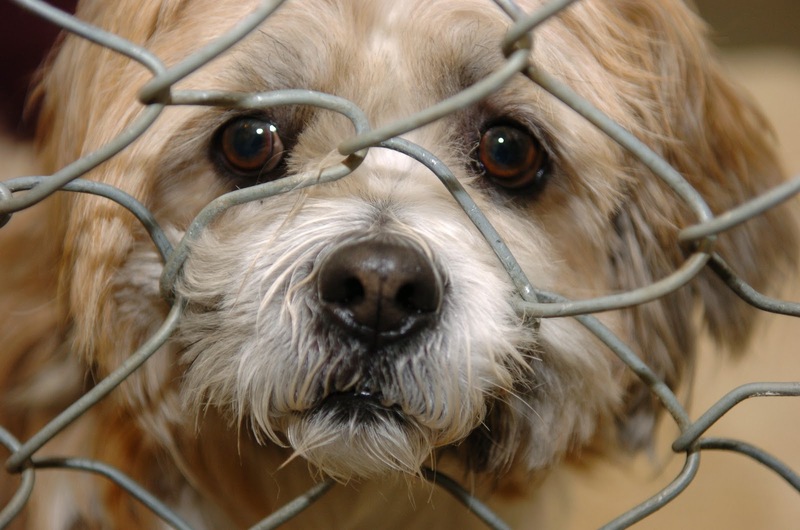 Next week, in the parking lot of KGET TV downtown, the SPCA will be taking donations to continue its good work in our community. 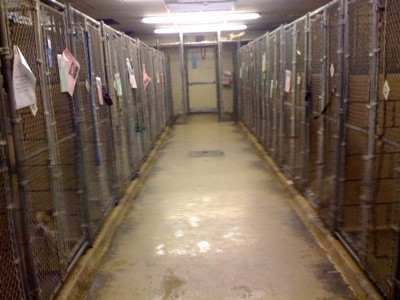 Said the SPCA's Chuck Nordstrom: "So people can see how we use their money we highlight some of our services right there in the parking lot, including a low cost microchip clinic, low cost male cat neuter and of course dogs and cats looking for new forever homes. These services would not be available if the community did not support our efforts. 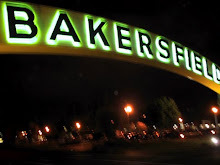 This will be next Wednesday, October 6, from 5 a.m. to 7 p.m.
* ... BAKERSFIELDISM: From a "real" East Bakerfield old-timer, Charles Duran: You know you're an East Bakersfield old-timer if "you shopped at Tony and Gino's deli on Kentucky Street just off Haley Street." John Arthur, who has served as interim editor for The Californian for the past three months, has been named vice president and executive editor. Arthur worked for 23 years for the Los Angeles Times, leaving last year as executive editor. He won two Pulitzer Prizes there for his coverage of the Northridge earthquake and the North Hollywood bank robbery and shootout. For the full story, read on the Californian's coverage here. 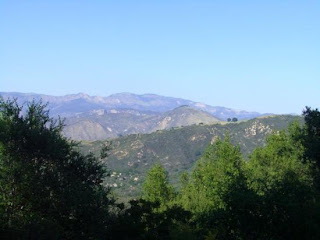 * ... LOS PADRES: I had a chance to spend an afternoon hiking in the Los Padres National Forest recently and left wondering why I don't spend every weekend there. Spectacular scenery at 8,800 feet and all within an easy hour of Bakersfield. 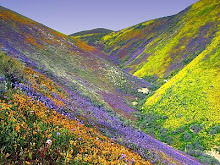 This is one of those national treasures right at our doorstep that folks in Bakersfield need to appreciate. If you haven't been, I'd recommend it for anyone fit enough to enjoy a good hike. Just take I-5 south, exit at Frazier Park and it's about a 30 minute drive to the parking area. 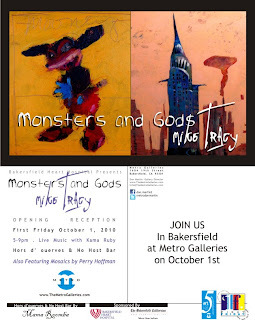 * ... FIRST FRIDAY: If you're taking in the First Friday activities downtown, make sure you stop by Don Martin's Metro Galleries on 19th Street for the opening of a provocative new show titled "Monsters and Gods." 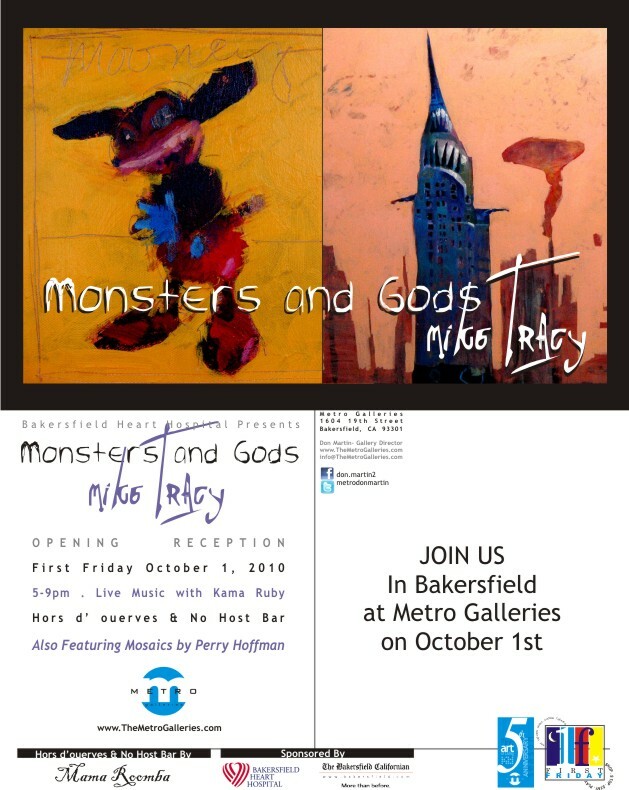 The show features the paintings of Mike Tracy, a former Disney animator whose work has hints of both darkness and whimsy. Some of his stuff reminds me of the dark paintings of Francisco Goya after the Spanish painter had gone deaf and was living in haunted fear of going insane. It's well worth a trip to catch this show. * ... KANSAS: Read an interesting piece in The Washington Post about the 1970s rock group Kansas making a comeback with college kids. Turns out the band, known for songs like "Dust in the Wind," is on tour with university symphonies. 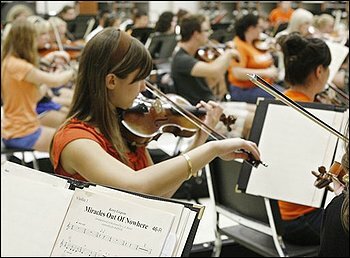 One of the school symphonies touring with the band is from Oklahoma State, where the daughter of local Dr. John Heidrick goes to school. The picture that ran with the story showed Erin Heidrick, a freshman, with her violin rehearsing in Stillwater, Oklahoma. (read the entire story here) Not bad considering Erin wasn't yet born when her dad was rocking to "Dust in the Wind." * ... DIAPERS: More than one reader has told me to "cool it" with my obsession of finding used diapers on our streets and in our parks, but this is one I could not resist. Reader Bryan Kelly was in a local Wal-Mart shopping for an inexpensive pair of Dr. Scholl's walking shoes when this happened: "After locating the size and style, I opened the box to make sure the shoes matched. There were no shoes in the box, only a SOILED Pamper. I assume it was soiled from the odor. I did not peek inside to verify my suspicions. That is the day I learned the shop online." * ... LEAVING CABLE: I have two friends who have canceled their cable service, fed up with the tiered pricing that sends bills nearing $200 a month, including internet service. So how do they survive? Both have plugged into the internet, connecting their TVs through new digital services and "boxes" that tap into websites that offer content or movies, like Hulu and Netflix. One friend has a 62-inch flat screen and no cable. Is this the future? * ... OVERHEARD: A man and his wife are at the Wal-Mart on Gosford Road Sunday when the power went out. Emergency power kicked it, but apparently the lights were out just long enough for some folks to take advantage of it. "As we waited in line we began to talk with the cashier (who) mentioned that within the first few minutes of the power being out some people attempted to loot items from the store." Good grief. * ... GARCES: Don't forget the annual Fall barbeque at Garces Memorial High School, always a popular venue to see old friends and enjoy a good meal. The school expects more than 1,500 people to attend, making it one of the "can't miss" social occasions of the year. Tickets are $25 and may be purchased at Garces or at the door. Proceeds benefit the schools athletic programs. * ... BAKERSFIELDISM: From Riley Parker: You know you're a Bakersfield old-time if "you remember seeing Sputnik in the sky north of town." * ... DOWNTOWN: Want a model on how to revitalize downtown? 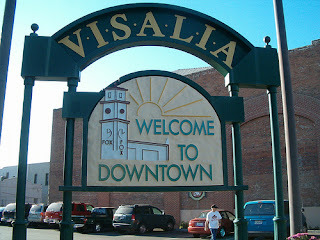 Then look no further than Visalia, which boasts a wonderful, safe downtown full of vitality and fun. Jim Houck, a former Bakersfield resident who now lives in Visalia, is observing the local debate about creating a special tax district here and wrote this: "It's amazing that a few folks are holding up what could be a great step forward for downtown Bakersfield. Visalia has the most successful downtown in the Valley, and PBID is one of the things that holds it together.. Downtown Visalia is alive six days and nights a week. The fact that there is an active business organization downtown has given it a lot more political clout than it looks like downtown Bakersfield has. I didn't have the sense that downtown Bakersfield has much input to what the city did to Chester Avenue ten or so years ago. Here, not a shovel would have been turned without the input and approval of downtown Visalians." * ... BIG WEEK: This will be one of those busy fall weeks that has something for everyone. 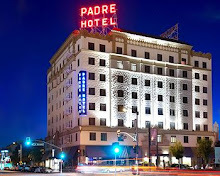 On Wednesday night country superstar Carrie Underwood is appearing at Rabobank Arena, and on Thursday evening the restored Padre Hotel is having its grand opening gala. There are still tickets for the Padre red-carpet event, where $125 gets you into the door with all the food and drink on the house. Then on Sunday, Luigi's celebrates its 100th birthday with a huge bash from 11 a.m. until 3 p.m. Tickets are limited and are available at Luigi's website. 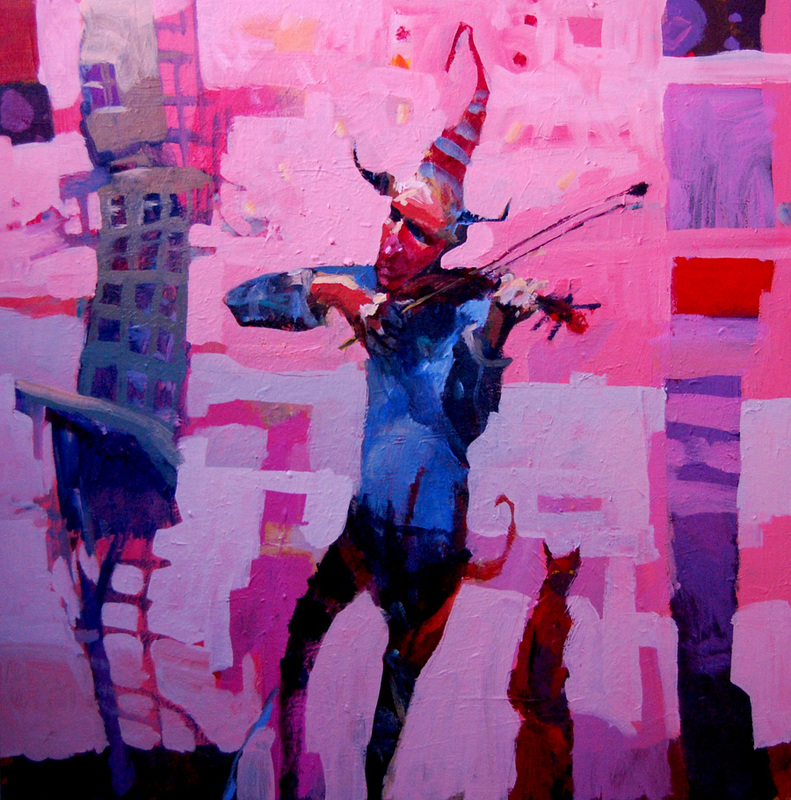 And don't forget First Friday, when downtown comes alive with the arts. Make sure to stop by Uricchio's Trattoria or your favorite locally owned restaurant to get a start on the evening. 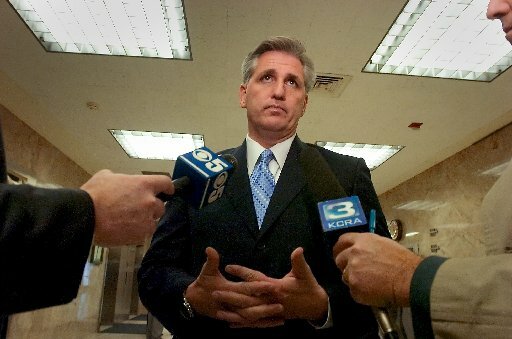 * ... KEVIN: Our local congressman, Rep. Kevin McCarthy, is in the thick of the fight for control of the House of Representatives in the November election. It's hard to watch cable news without seeing McCarthy, one of the GOP's "Young Guns," sparring with the Democrats over the direction of the country. 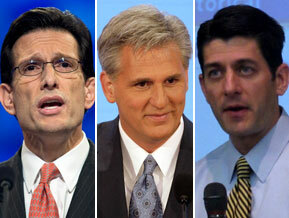 If the Republicans do take control of the House in November, McCarthy will be in a key leadership position. * ... SCHOLARSHIP: I dropped by the lovely home of Janis and Vernon Varner this weekend for "An Elegant Evening of Wine," an East Rotary event that raised more than $25,000 for the Joe Alexander Scholarship fund. Meir Brown and his crew from Cafe Med were there doing the catering and a number of wineries provided the drinks. It was a perfect sell-out evening for this event that is now in its eighth year. Spotted in the crowd were incoming District Attorney Lisa Green and husband Jeff, Bank of the Sierra senior vice president Michael Olague and wife Christine, City Councilman David Couch, CSUB President Horace Mitchell, accountant Geoff King, businesswoman Molly Busacca, CASA development manager Teresa Fahsbender and husband Bryan, potato farmer Brian Kirschenmann and wife Katie, event emcee Phil Icardo and wife Suzanne, among others. 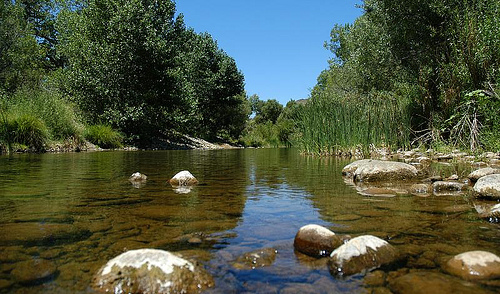 * ... MEMORY LANE: Barbara Miner sent this missive about growing up in Bakersfield. "You could walk from Brundage Lane to where the Circle is today on Chester Avenue. You could walk out of a movie theater in the summer and crunch, crunch on June bugs that were all over the sidewalk. Packing a lunch when riding your bicycle out to Stockdale, because it was 'way out in the country.' Brundage was just a two-lane road then. The street crossing signals used to have an arm that would come up for when to stop." * ... SPOTTED: Used diaper rolled up and sitting next to the curb at Beach Park Saturday morning, not 20 feet from a trash can. 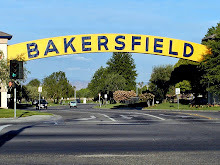 * ... BAKERSFIELDISM: This from my friend Jeff Green: "You know you're from Bakersfield is you remember Garces teacher Miss Smile and her dog Peppy and you were sent back to row F."